Baby-monitor manufacturers can relax… for now. Although the Sikker Intercommunication System is only a concept at this point, we’re betting that the baby monitor/radio/alarm clock/watch hybrid will be at the top of every parent-to-be’s baby registry if it ever comes to fruition. Featuring a pair of bracelets — one for baby and one for Mom or Dad — the Sikker (Danish for “safety”) works together with a base station to relay biometric data, such as the baby’s temperature and heart rate. Besides offering “listen” and “speaker” options, the Sikker also allows parents to play songs remotely. Baby-monitor manufacturers can relax... for now. Although the Sikker Intercommunication System is only a concept at this point, we're betting that the baby monitor/radio/alarm clock/watch hybrid will be at the top of every parent-to-be's baby registry if it ever comes to fruition. Featuring a pair of bracelets � one for baby and one for Mom or Dad � the Sikker (Danish for "safety") works together with a base station to relay biometric data, such as the baby's temperature and heart rate. 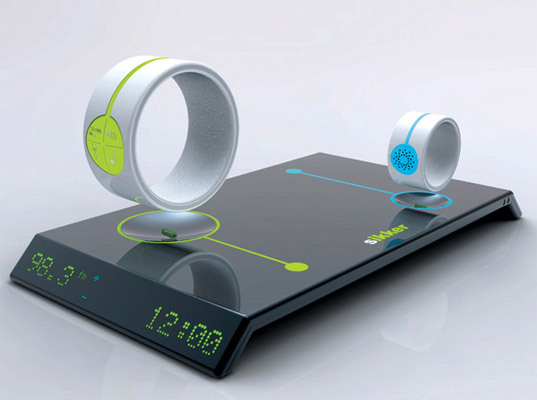 Besides offering "listen" and "speaker" options, the Sikker also allows parents to play songs remotely.